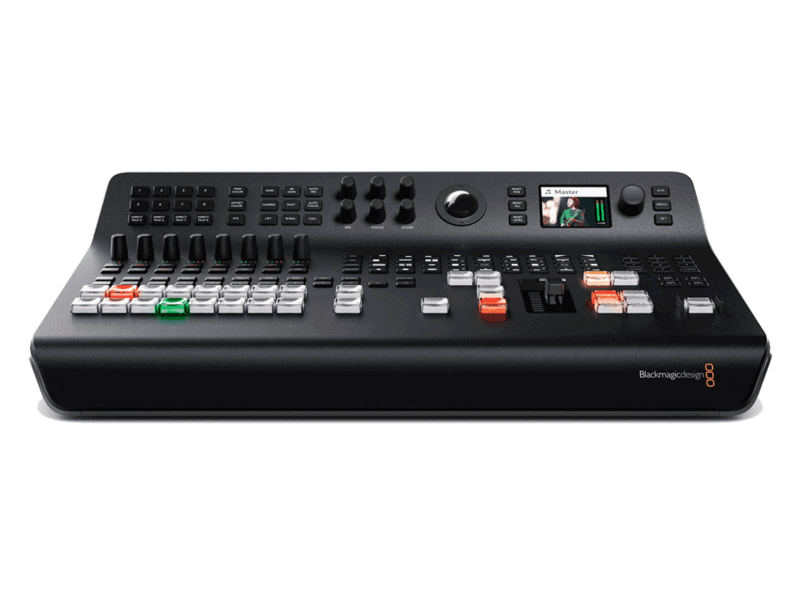 Blackmagic ATEM Television Studio Pro 4K are the first live production switchers designed for both broadcasters and AV professionals. There are 2 powerful HD models with 4 SDI and 4 HDMI inputs and a new Ultra HD model with 8 12G-SDI inputs. Packed with high end broadcast features, ATEM Television Studio models feature re-sync on all inputs so you always get clean switching whether you’re using professional or consumer cameras. Plus, you get multiview output so you can see all of your sources, preview and program on a single screen, aux out, built in talkback, 2 still stores, an audio mixer, camera control unit and more! 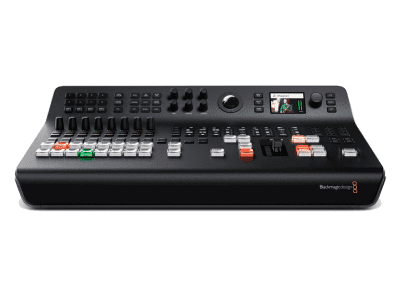 ATEM Television Studio Pro models have the same features plus an integrated professional broadcast hardware control panel and additional CCU controls. Both models are perfect for live production, episodic television, web shows, AV or even live coverage of video gaming competitions! Simply plug in your cameras, game consoles or computers and start switching live! The new Blackmagic ATEM Television Studio Pro 4K model includes all the benefits of the HD models and now adds Ultra HD capability with more SDI inputs! With 8 independent 12G-SDI inputs, ATEM Television Studio Pro 4K can handle all popular HD and Ultra HD formats up to 2160p60. Each input features re-sync as well as a full low latency standards converter so input is automatically adapted to the switcher’s format. That means you can even have 8 inputs, all running different video formats! The upgraded Fairlight audio mixer features dynamics, 6 band parametric EQ, dual mono channel split and stereo simulator with audio delay on the analog inputs. ATEM Television Studio Pro 4K also features the ATEM Advanced Chroma Keyer, Ultra HD multiview and motion clips in the media pool! The Blackmagic ATEM Television Studio Pro 4K features 8 standards converted 12G-SDI inputs so you can connect to both HD and Ultra HD sources. 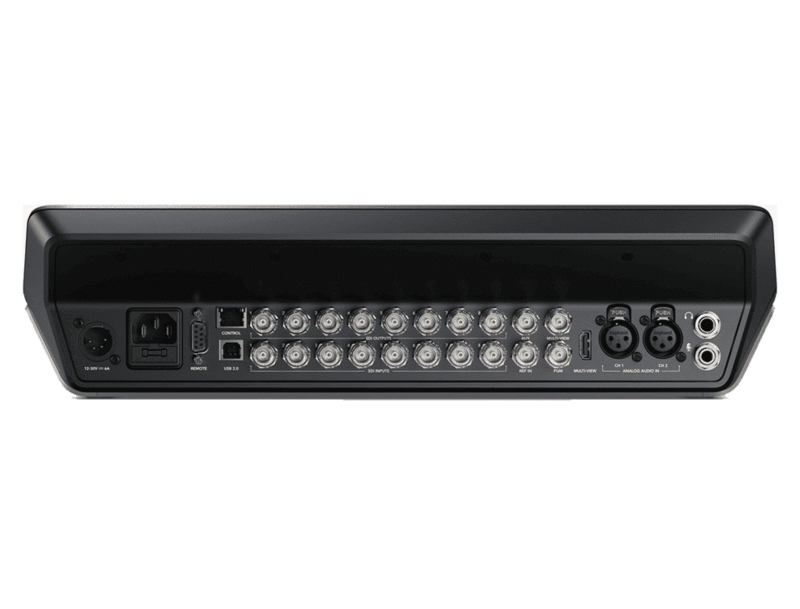 Each input also features a corresponding 12G-SDI output that can be used for camera return feeds with embedded control data, and mix minus is available on each 12G‑SDI output. Blackmagic ATEM Television Studio Pro 4K model now has a new incredibly powerful Fairlight audio mixer that includes pro audio features such as 6 band parametric EQ, compressor, limiter, expander/noise gate, pan, audio channel split to dual mono, stereo simulator on analog and mic inputs and an audio delay on analog inputs. SDI Rates 1.5G, 3G, 6G,12G. Total Audio Inputs 2 x XLR. 1 x Microphone. Total Audio Outputs 1 x Headphone. SDI Video Inputs 8 x 10-bit HD/UHD switchable. 2 channel embedded audio. Reference Inputs Tri-Sync or Black Burst. Video Input Re-Sync On all 8 inputs. Frame rate and format convertors On all 8 inputs. SDI Program Outputs 9 x 10-bit HD/UHD switchable. SDI Audio Outputs 2 Ch embedded into SDI output. Multi View Video 1 x SDI and 1 x HDMI. SDI Compliance 292M and 424M, 2081, 2082. Audio Mixer 12 input x 2 channel mixer. Upstream Keyers 1 with Chroma/Linear/Luma key. Talkback Support Built in, uses aviation headset. Mix Minus Support Yes, on 8 camera PGM outputs. Transition Keyer (Stinger/DVE) Stinger and DVE. Interface Minimum monitor resolution of 1366 x 768. Routable Windows 8 routable and 2 fixed for Program and Preview. Tally Red for program and green for preview indication. Multi View Monitoring 1 x 10 Views. Multi View Video Standard HD/Ultra HD. Warranty 12 Months Limited Manufacturer's Warranty.